Have you checked your Gmail usage? You will wonder if you found it's size in Gigabytes[GB]. You Google account usage is nothing but the shared storage with Gmail email service, Blogger, Google+ photos, Google Drive files. All of your Google Gmail account data get 15GB storage drive space for everyone including Google photos storage limit. However, we know other data usage and storage, but not that much aware of email data stored into the account. The quick question is how do I delete a large number of emails in Gmail? Once you reached that limit of 15GB, your Gmail storage quota exceeded, you can access Gmail email account but then you can't send or receive emails because you're out of storage space. You must know that the Gmail makes it difficult to delete an attachment without deleting the messages or gmail archive. So the question is, how to find large emails in bulk & track down big attachments? How to free up space in Gmail account? How to increase Gmail storage space free? Gmail ran out of space? - Stuck out of storage google drive or unable to send/receive emails, you required to make room for new emails, or you need to delete large attachments to save storage space. If you don't know what's eating up your Google space, then this tutorial will help you in finding the emails with the largest attachments in your Gmail Account. Let's free up space in Gmail mailbox by checking the large attachments running out of your Gmail space. Learn how to search these large sized emails and remove them for making more room in Gmail storage drive. Also, learn how to free up storage space on your Google account and tricks to clear Google drive space to increase storage. In the previous article you have seen Use Facebook Without Internet [FREE] or Data Plan From Any Mobile. But today we are going to learn some Gmail related tutorial. This tutorial is also that much important for those who have always on Gmail and have too much of mails consisted in their mailbox or who don't have that much enough space for new incoming mails. Learn how to get rid of this issue & how to use gmail storage carefully. 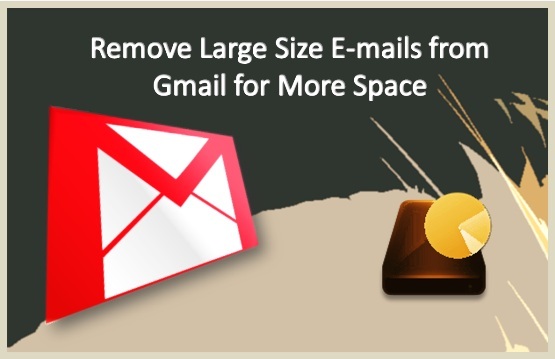 This unrelieved Gmail "size" search operator quickly search large size emails from your mailbox and reclaim lost space by deleting all the unwanted large size emails. In topmost search field, put "size:10485760" OR "size:10MB"
This code will then find emails having size 10MB. Note: Before deleting any email recheck it or you can move it to your Google Drive. If you know any other better idea then you can share it via the comment section shown below. Don't forget to Like, Share and subscribe to our tech updates.